•Master Blaster Fleet: Any kit, launch from the beach, get around one bouy any way you can, and get back! First back to the flag wins. 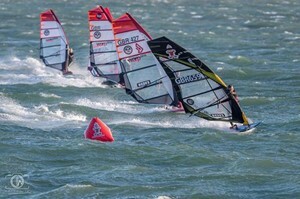 •Amatuer Fleet: The stepping-stone to the Pros, you need to be able to gybe around a 5 bouy downwind course. •Pro Fleet: People who have plenty of competitive experience, and racing slalom within the International Rules. If you are not a member of the UKWA you can still enter in the Master Blaster fleet, although we do have to charge an extra £10 to cover event insurance. For the Amateur or Pro fleet you need to be a UKWA member to enter an event, then online entry is easy (see membership for more).